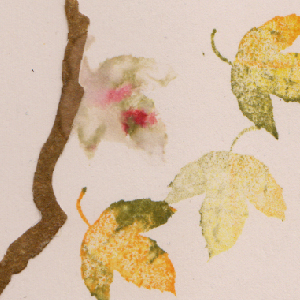 This week's Created By Hand & Quietfire Creations challenge is "Leaves". Well fall is gone, winter is here in the Calgary region. We've have several days of snow already. SIGH!!! So I inked up a bunch of Flourishes leaves from the "Falling Leaves #SS078" set with Distress pads in red, yellow and Forest Moss, misted with water, and stamped, repeating the process to do the whole left border on a cream toned card. Dried it and colored the background of the border with Super Ferby colored pencils in a silvery green. Added a black embossed line using a PaperMate Eraser Mate pen and black embossing powder. 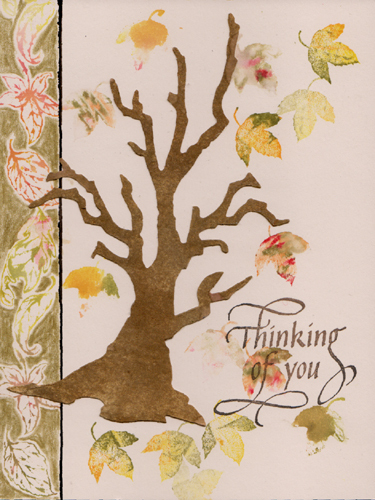 Die cut the bare tree (Tim's Sizzix die), inked it up with Walnut Stain, adhered to card. Stamped a bunch of leaves, again using the Distress pads and misting with water, but also doing a 2nd generation stamping, so some were a deeper color and some a lighter color. Stamped the sentiment with Versafine Vintage Sepia. PS: This week one lucky Created By Hand Challenge participant will receive one Quietfire stamp. The winner will be randomly chosen and posted with the Sampler on the Created By Hand blog! Happy creating! I really like the way you did your leaves. TFS the details. The card turned out stunning!